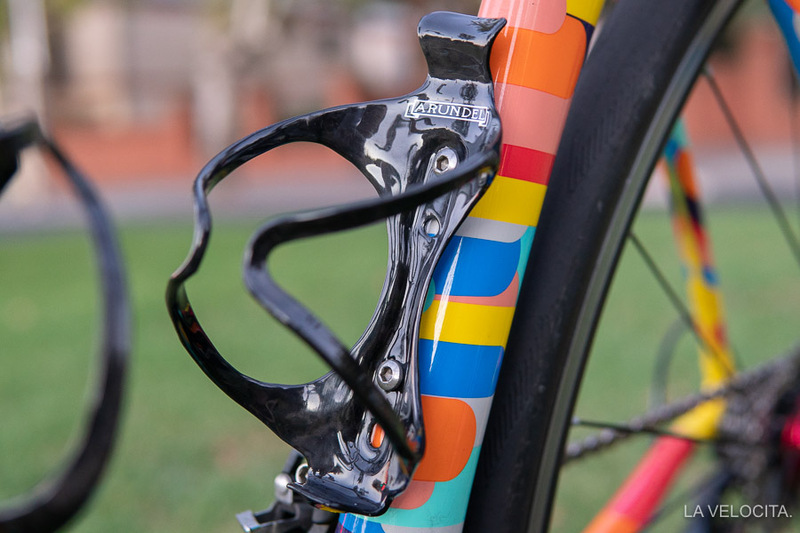 Arundel Mandible bottle cage review - LA VELOCITA. If you’re into value-oriented, sensible, and tangibly performance-positive upgrades for your bike then carbon bottle cages aren’t for you. In fact, carbon bottle cages are silly. Gloriously, unnecessarily, ostentatiously silly. I love them. I own multiple sets of carbon cages because I’m just that kind of person. So, if you’re going to buy carbon cages that cost about the same as a nice set shoes, or a decent helmet, then you gotta do it right. Carbon bottle cages have a simple job; be light and hold your bottles but that doesn’t mean they’re all good at it. I got sent some Arundel Mandibles to test and determined that sometimes more is more when it comes with carbon cages. It might sound ludicrous but the Arundel Mandibles are relatively heavy at 34 g including bolts (28 g without bolts) compared to some of the other carbon cages I’ve seen and used. I’ve held a 4 g Tune bottle cage in my hand which was just a ribbon of carbon with some holes punched through for mounting bolts. My own Tune Wassertrager 2.0s are an absurd 9 grams without the bolts and Tune Wassertrager Unis are 26 g per cage including bolts. I wasn’t blown away by the weigh-in but don’t panic though because there’s justification for those extra grams. Overly light cages can be a pain in the arse and even damage your bike as I’ve found out personally. The ethereal Wassertrager 2.0s present a couple of problems owing to their thinness and flexibility. I can only use narrow-based bottles in them because they grab wider ones - like the ubiquitous Camelbak Podium - too tightly. You have to rotate and wrestle many bottles out as the carbon stubbornly grips them. They also flex and allow vibrating bottles to whack the down tube, leaving a small mark. My Wassertrager Unis are vibration prone too. I have to regularly re-tighten the bolts because the incessant vibration gradually loosens them, and makes annoying rattling sounds in the process. The Arundels are rock solid by comparison. They have thicker, less-flexible carbon arms. In fact, they are quite tight and put a noticeable pinch on my bottles. I gave them the stiff-bike-gravel-road test a few times after they did nothing abnormal or noteworthy on regular roads. Long stretches of gravel and high-frequency vibrations did not unsettle my bottles at all. On one ride I even stopped to pick up someone else’s bottle that had been spat out in front of me. The mandible style of cage is, by far, my favourite regardless of what material they are made of. 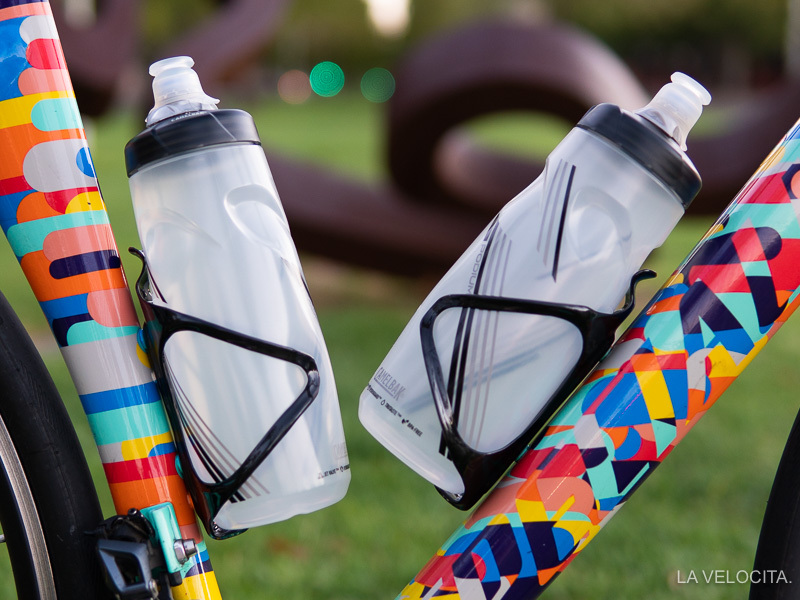 Bottles willingly slide in from the top and the flexible and curved mandible arms expand around the base of the bottle and gripping around as you hit the bottom. As above, Arundel’s offerings are quite tight. Some bottles need a fair shove to get in and a decent pull to get them out but most behave just fine. The final test for the Mandibles will take several months and hundreds more bottle insertions to stress the carbon and see how firm it still holds. Arundel’s Mandible carbon cages aren’t remarkably light and fall into an expected price of $109 AUD compared to similar carbon cages. Instead, they’re the most functional carbon cages I’ve used with more focus on strength and resilience. Firmer grip and low flexibility makes them trustworthy to hold your bottles and, I expect, should give them a longer useable life. Check them out if you want a sensibly silly set of carbon cages. Disclosure statement: These cages were sent by Bikesportz for review. It’s not a paid review and we don’t get any proceeds from the sale of Arundel product. I’m a weight weenie. So being asked to test a set of 1185g Tune Airways carbon clinchers left me positively salivating. The only problem I have now is; how do I go back to normal wheels?